Moving Towards the Inclusive Church! With thanksgiving and a challenge, PDC, a network of the Presbyterian Health, Education & Welfare Association (PHEWA), is offering Pioneers and Prophets, our resource for 2016 Disability Inclusion Sunday on June 12. We challenge you to make every Sunday – and every day of every week – a day when no one is excluded, when all are welcomed. 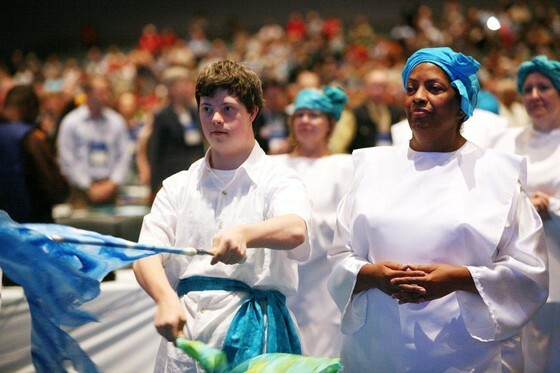 Presbyterians for Disability Concerns (PDC) celebrates the gifts of all people and is committed to affirmation, support and advocacy for the rights and responsibilities of persons with disabilities in the total life of the church. A disability is any condition that has the potential to prevent an individual from living a full life. Disabilities come in many different forms but the most destructive one is that of attitude. An attitude that is all too often held by the "temporarily abled." An attitude that says, "No you can't!" The message of Presbyterians for Disability Concerns says just the opposite: "Yes we can! Because each one of us was created for joy and relationship. Our job is to remove the barriers that would keep anyone from fulfilling their potential." Click here for a sermon on disability inclusion from First Presbyterian Church, Birmingham, Michigan. PHEWA's Faith in Action Fund! PDC offers resources that cover a range of disabilities, with new resources always in the pipeline. From developmental disabilities to Post Traumatic Stress Disorder (PTSD) to issues of mobility and more, Presbyterian Disability Concerns is committed to providing resources that educate and empower all persons. Feel free to download any of our resources and please contact us if you have further questions.